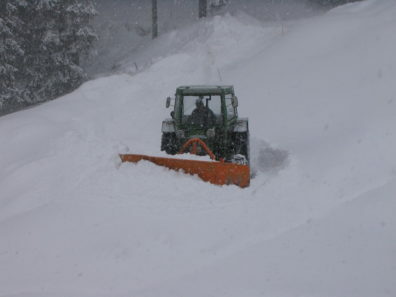 With the arrival of the spring equinox, many of us in the Pacific Northwest were still digging out from the snow or dealing with seasonal flooding, the impacts of a cold and snowy winter fresh in our minds. Just a couple of weeks later, news of the fire season is already starting. Along with fire and drought, extreme weather events are happening more frequently than historical records suggest. I’ve been surveying the state of weather-related affairs across the region, and summarize here some of the conditions relevant to agriculture. While large snowpacks are inconvenient and costly for travel and agricultural operations alike, drought indicators and water availability forecasts for the coming season have improved since the start of the calendar year. Cold weather has been problematic (check out Laurie Houston’s February article on its impacts on dairy and cattle operations). Following historic February snow, flooding on the Snake River Plain, and unusually cold conditions pretty much everywhere, just about everyone is happy that conditions at the first day of spring were returning to normal. The National Water and Climate Center publishes a weekly Water and Climate Report on the state of climate and water resources throughout the country, with emphasis on water resources, drought, and reservoir information in the western regions. This summary report is helpful in tracking how weather impacts change over the course of the season. The report presents statistics comparing the current season to weather and water availability over the last four decades. It is a great complement to daily weather reporting and local observations, and helps keep in perspective how the weather today compares to long-term averages. Figure 1: Precipitation from SNOTEL stations and basin estimates, totals since 01 October 2018 (percent of normal). Orange areas are below average, Green areas are above average. 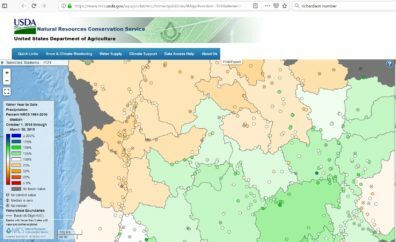 Source: NRCS Interactive Map, Accessed 20 March 2019 (https://bit.ly/2YUiG8d). So how did the snow and cold weather this winter compare to previous years, and what do drought and water availability models tell us about what to expect for the coming growing season? In many areas of the Northwest there was a lot of snow that stuck around for a long time, especially in February. At the end of winter, snowpack was at or above normal in most locations across the West. However, in many locations in the North Cascades in Washington and in North Idaho’s panhandle, snow was still below normal levels for this time of year (Figure 1). 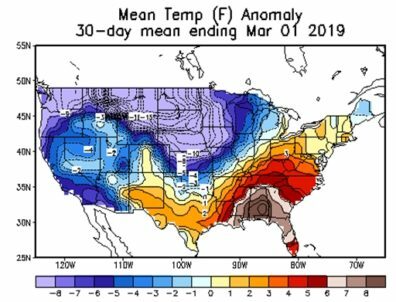 Temperatures were unusually cold this winter, particularly in February (Figure 2, and see John Abatzoglou’s latest article), but right before the start of spring they returned to spring normals. As a result, snowmelt is contributing to runoff and, although not as extreme as in the Midwest, some parts of the Northwest have seen localized flooding. In Southern Idaho, runoff from farm fields has been observed, along with topsoil erosion. Here in the Palouse, rising streamflow was markedly more turbid, carrying the areas fine-textured soil. This kind of erosion can be minimized with farm practices such as cover cropping, by increasing surface infiltration, and by mitigating the out-flow from field drainage systems. For more thoughts on the impacts of climate change and weather on soil erosion, see Kristy Borrelli’s AgClimate article from 2015. Figure 2: Unusually Cold temperatures throughout the PNW in February. Source: U.S. Daily Temperature Analysis, National Weather Service/NOAA, Accessed 20 March 2019 (https://www.cpc.ncep.noaa.gov/products/tanal/temp_analyses.php). Unusually low temperatures, late melting snow, and the rapid shift to spring all complicate early season farm activities. In addition to being unable to get out onto saturated fields, a late season delays the start of planting, and slows early season growth. Integrating cover crops and grazing into rotations can be complicated by wet soils late into the spring, and timing fertilizer application to reduce runoff losses is also complicated (see Georgine Yorgey and Karen Hills’ article about diversified cropping practices). Best practices for pruning of fruit trees, application of pesticides and fertilizers, and timing of dormant sprays all depend on calculating growing degree days (GDDs), but it can be difficult to know when to start counting degree days in a year with really unusual winter temperatures. Cold temperatures can reduce some pest populations, especially insect pests, but voles and other larger pests can actually cause more damage to crops and trees when there is little else to eat during a cold winter. Long-term weather records are useful context when recording phenology of early-season crop development and the seasonal timing of pests. Figure 3: Indicators of drought persist throughout the Northwest, but are significantly improved from the beginning of the water year (October 1) largely due to heavy winter snow, especially in southern Idaho. Drought conditions persist throughout Oregon. Source: National Weather Service/NOAA, Accessed 20 March 2019 (https://www.cpc.ncep.noaa.gov/products/Drought/). Finally, the long-term weather record also helps predict water resource management. 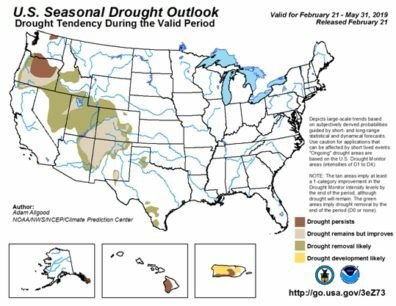 When considering water availability later in the season, soil moisture storage, reservoir capacity, and snowpack are all indicators to be considered. The large snowpack in many parts of the Northwest have helped reduce drought indicators (Figure 3), but persistent dry weather, especially in Oregon, contribute to less overall storage. Warmer winter temperatures can diminish the ability of snowpack to provide water later in the season, and rain on snow events are a primary cause of extreme flooding. 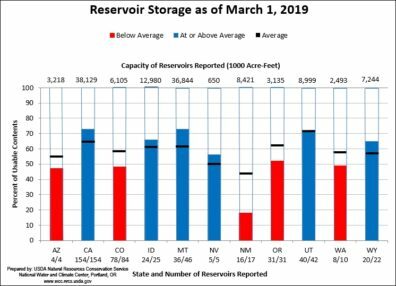 Relatively low reservoir storage in Oregon and Washington (Figure 4) indicate that water availability may still be a concern in some places for the coming year. Figure 4: Reservoir storage in the western states. The impacts felt by agricultural producers from this cold winter have varied across the region. Now that we seem past the remarkably cold weather of February, farming activities are ramping up and trying to recover from a late start. In the coming months, keep your eyes peeled for more articles discussing this winter’s weather and how climate variability figures into long term planning. This entry was posted in Uncategorized on April 8, 2019 by sonia.hall.